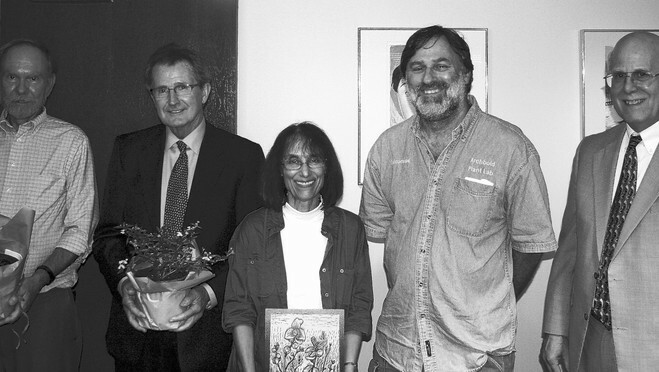 From left: William Gregory, professor of biology; Donald L. Applequist, executive director of the SFCC Foundation Inc.; Mollie Doctrow, curator of the Museum of Florida Art and Culture; Eric Menges, director of plant ecology at Archbold Biological Station; and Norman Stephens, president of SFCC, were key figures in the creation of the Wildflower Wayside Shrine Trail at the college. AVON PARK – Even the late summer rainfall couldn’t dampen the atmosphere of the dedication ceremony for the Wildflower Wayside Shrine Trail at South Florida Community College. The trail is the brainchild of Mollie Doctrow, curator of SFCC’s Museum of Florida Art and Culture. She has created a partnership with Archbold Biological Station, forging a joint effort of the arts and science communities of Highlands County. Grants received from the U.S. Institute of Museum and Library Services and the Florida Division of Cultural Affairs, as well as contributions from Bok Tower Gardens and the Highlands County Audubon Society, helped fund the project. Although it has taken some four years to get the proper grants to make the exhibit a reality, Doctrow said it has been a lifelong passion, from her childhood days in Los Angeles to her 2005 arrival to the Lake Wales Ridge. It was a backpacking trip in her youth that planted a seed that has come to fruition at SFCC. The trail is also inspired by wayside shrines that are popular in artwork from India, where items of nature such as trees and stones are the subject of the pieces. “It’s artwork that is meant to be touched, both by the hands and the eyes,” Doctrow explained. The Wildflower Wayside Shrine Trail features native plants of the local scrubland. There are 51 documented plants along the trail, which at the current time is less than a fifth of a mile. Among those plants are six endangered species, including the scrub blazing star and the pygmy fringe tree. Doctrow created nine shrine boxes, each dedicated to scrub habitat plants. Six of these boxes are located along the trail itself, while the other three will be located at Archbold Biological Station later this year. The boxes feature woodcarvings with relief so that they will be much like the wayside shrines of India, where visitors can both see and touch the work. The physical trail was mostly natural. Very few plants needed to be cleared for the exhibit as it looks now. The trail has been open to the public since March. The shrine boxes located along the trail are at the various grow sites of the natural flora. Within the boxes will be additional information on the subject plant, including drawings of the different stages of the plant’s life. Visitors can leave journal entries as well. “This will provide a sense of community,” stated Doctrow. Doctrow also highlighted the various educational aspects of the trail, which brings together art, science, and English. She expects it to be a resource for the college, and school and community groups. Area educators are already developing curriculum materials related both to the trail project and the Lake Wales Ridge. Three-hundred area students have already experienced the exhibit, and Doctrow expects those numbers to rise. Beyond the education aspect of the Wildflower Wayside Shrine Trail, Doctrow hopes the project will be enjoyed and appreciated by the community. It is her goal for the trail to help foster conservation efforts to preserve the scrub habitat.